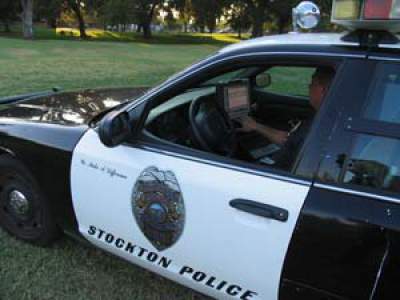 A 15-year old male suspect was arrested early this morning after he led Stockton Police on a short vehicle pursuit. Stockton Police patrol officers attempted to stop a vehicle allegedly being driven by the juvenile near El Dorado and Church streets in the Seaport District for a traffic violation. Instead of stopping, police were led on a short vehicle pursuit. The suspect crashed the vehicle in the 400 block of S. California Street and fled but was caught after a short foot pursuit and taken into custody without further incident. The car was an unreported stolen vehicle. The suspect’s injuries were non-life threatening and was taken into custody for auto theft, possession of stolen property, traffic charges, failure to yield, a felony arrest warrant, and resisting arrest.